SkyeShed itself (website here) might not be everybody's cup of tea, but the portfolio of the architectural firm who designed it, Dualchas Building Design of Glasgow (and Skye) is magnificent - click here and be prepared to spend a fair bit of time enjoying their work. What's really interesting is that the same firm also offer kit houses under the brand name Hebridean Homes. Any of these would look great nestling in between a few County Down drumlins, or on the foothills of County Antrim's hills and glens. Regular readers will remember the series of posts here about William MacEwan during November and December. It was Macewan who popularised 'The Old Rugged Cross', which Joe tells me in decades gone by was regularly sung at social events across Scotland. Below is the Carter Family's version of a (lyrically) very similar piece, recorded in the 1930s. The guitar style (of picking the melody on the lower strings, but with rythym strumming as well), and the dead-flat male harmony sung by AP Carter) is superb. And Scotch-Irish of course. This was written in 1894, whereas 'The Old Rugged Cross' was written in 1913. A lovely story of how Andrew Winton from Woolfords near Lanark found himself behind enemy lines in Germany in 1945 - where mutual admiration for the poems of Robert Burns created common ground between friend and foe. Click here. The story goes that, shortly after Northern Ireland was established in 1921, the engineer and inventor Harry Ferguson approached the new Prime Minister, James Craig. Ferguson is said to have told Craig that to really put the new Northern Ireland on the map, what the country needed were glamourous world-class events. "... British racing owes a great debt to Harry Ferguson, who was the moving spirit behind the revival of the Tourist Trophy. It was he who came to Brooklands one day in 1927 and approached Captain Phillips, Competitions Manager of the R.A.C. and later Clerk of the Course at all the Ards races. If the Ulster Government, Ferguson enquired of Captain Phillips, were to approach the R.A.C. with an invitation to run a race similar to Le Mans over closed roads in Ulster, how would they react? Ferguson was soon assured that they would warmly welcome the suggestion, and returned to Belfast to set the machinery in motion. It was originally intended that the race, like the French classic, should be a twenty-four hour affair, but this the Ulster Government would not permit..."
Nowadays, the programme of world-class events for 2012 are different than they were back then. And I know some folk who get worked up about 'flashy events' and suchlike, seeing it all as trivial and definitely as a waste of money, and then harp back to 'the good old days when none of that oul nonsense was aboot'. For those of you who think like that, you'll enjoy this painting of the 1932 Ards TT - especially the advertising banner. 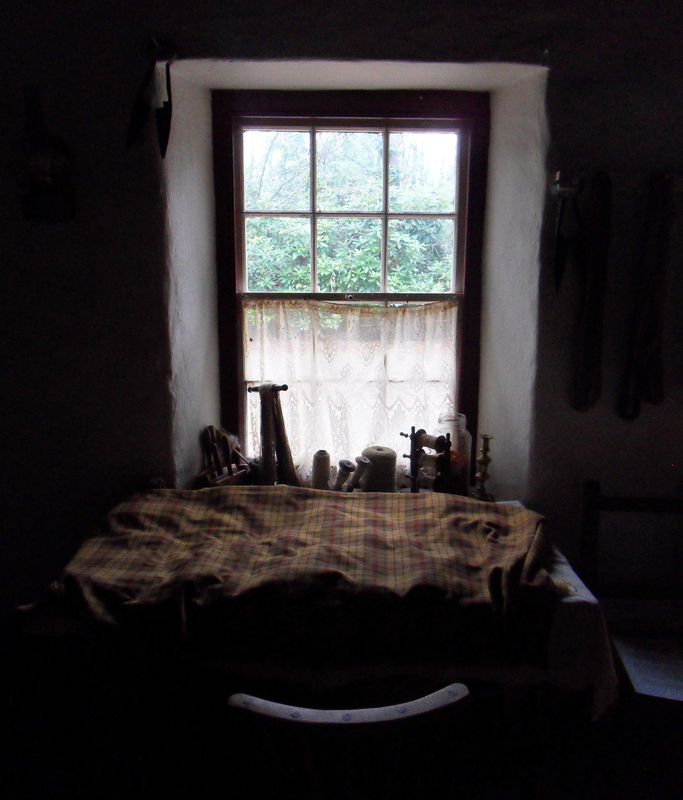 I was pleasantly surprised to see a yard of Ulster tartan fabric inside one of the cottages, spread out on the window table. It wasn't labelled though, so there was no deliberate 'interpretive' contrivance about it. I knew what it was, and it seemed to belong there. Click to enlarge. The recent blog posts on the US Ambassador coming to Belfast seem to have worked - they have attracted attention and a few people have asked if this blog is becoming the Ulster-Scots version of Wikileaks! The truth of course is that those postings were set exactly 100 years ago in 1912, although I tried to avoid making that too obvious. The launch of the Titanic and the signing of the Ulster Covenant were just two of the big events that year - the newspapers of early 1912 show that the Ambassador's visit to Belfast was another high-profile occasion, and one which further demonstrated the historic and cultural links with Scotland, and also with America. It was announced yesterday at a meeting of the Presbyterian Historical Society that the Hon Whitelaw Reid, United States ambassador in London, will deliver a lecture on ‘The Ulster Scot’ under the auspices of the Society in the Assembly Hall, Fisherwick Place, on 2nd or 3rd April next. The Hon Whitelaw Reid has been Ambassador to the Court of St James since 1905, and was Special Ambassador to Great Britain for the Queen’s Jubilee and the Coronation of Edward VII. Being of Scotch Covenanter descent, his remarks on the Ulster-Scot, and the Scotch-Irish pioneers in America, will appeal with special force to an Ulster audience. He is the author of several works on historical and economic subjects. He will be the guest of Sir William Crawford during his stay in Belfast. Reid had first given the address in Edinburgh in November 1911 (at the Synod Hall) for the Edinburgh Philosophical Institution. 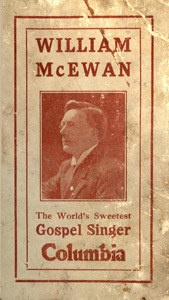 (this was the same month that Glasgow singer-evangelist William MacEwan was in London making what are said to be the first-ever gospel recordings for Columbia Records). 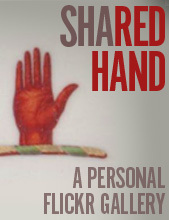 Reid's family roots were in County Tyrone - his grandfather was from near Cookstown and his grandmother from near Omagh. So it was natural that Whitelaw Reid should deliver the same lecture in Ulster. (PS - I hear that there are now thoughts in some quarters to mark the centenary of Reid's visit). The latter yields me full relief.."
- from Gospel Sonnets by Ralph Erskine (1745). There is a statue of him in Dunfermline today; he was buried at the Abbey, where most of King Robert the Bruce is also buried. "a triumph of small over large, right over might and local over global"
Excellent article here by Michael Hance on Scottish Review. And, to be fair, the initial article by David McVey here also rings true. So Ulster groans with day after day of RMS Titanic coverage in the press, looking toward the much-talked about date in April when the action finally gets underway down at the old shipyard in Belfast. The pressure is now mounting to ensure that the investment of millions of pounds results in a scramble of ticket sales, and of course the long term 'sustainability' which will justify the money spent. Meanwhile the future of the United Kingdom looks shaky, with prominent voices clamouring for independence and 'secession'. Ulster simmers with political discontent, affecting the economy, with strong rumours that massive public gatherings will be called in the Autumn. News coming out of Continental Europe just reinforces the climate of uncertainty. Yet in the midst of all of this the US Ambassador sees an opportunity to change the story, to come to Belfast to remind us all of our cultural heritage and connections with Scotland. High profile politicians seem to be finally 'getting' the importance of our historic Ulster-Scots identity. 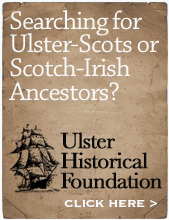 ... to give landmark speech on the Ulster-Scots to the Presbyterian Historical Society in Church House, Belfast. Date is 28th March, at 8.00pm. Subject 'The Ulster Scot'. Forget about the Titanic activities on April 10th, or the Ulster Covenant activities on September 28th, this is the event of the year. More to follow later. The Black Crowes (from Atlanta, Georgia USA) were one of the bands I discovered when in my late teens and early 20s. I've seen them in concert in Belfast at least once (maybe twice, memory's a bit rough nowadays). I remember reading an early interview with the core of the band, brothers Chris and Rich Robinson, in Kerrang! magazine in which they described their parents as 'Scotch Irish mountain folks'. Here are some clips from YouTube that some of you might enjoy. The Black Crowes are currently on a 'hiatus'. Ulster 1912 was the setting for the Ulster Solemn League & Covenant, which was signed by over 470,000 people. Over 14,000 signed in Scotland, mainly in the west (through Ayrshire, Lanarkshire and Renfrewshire) and along the central belt from Glasgow to Edinburgh, with a smattering in Fife and around Stirling. And Ireland was where the threat to the United Kingdom lay. 100 years on, the constitutional debate has shifted across the water to Scotland. Will the people of Scotland vote for independence from the rest of the UK? Will the terms of the referendum be fair and clear? I have friends in Scotland on both sides of the debate. I know some who vote SNP regularly (because they find the SNP to be a capable political party who get things done) but who wouldn't want independence. Regardless of what happens politically, the historical connections between Ulster and Scotland will be unchanged and the cultural ties will still remain. Portpatrick will not float further away from Donaghadee. Kintyre will not drift further away from Antrim. We will continue to share a cultural inheritance across the narrow sea, a separation so small that it's often called The Sheugh (ie a field-drain) with the other side visible with the naked eye. In 1912 there were over 14,000 Ulster folk in Scotland who signed the Ulster Covenant. No doubt there were thousands more who didn't. But how many Ulster people live there today? Personally speaking, I would like to see the results of a future Scottish census which would ask the people there if their parents, grandparents or great grandparents were Ulster people, and/or Irish people. Now that's a statistic that would be really interesting. Fer picnic sites an' scenic beauties..."
2012 will be a year of important events - in Northern Ireland the centenary of the launch of the Titanic looks like the biggest event here, but later in the year there will also be the centenary of The Ulster Covenant. Below is an old photo I came across recently, which shows Lord Templetown signing the Covenant (presumably in Belfast) on a military drum from 1798, thereby invoking the ghosts of a century before. The family's Wikipedia entry says that the next Lord Templetown also had a role in Scotland - he was a member of the county council of the Stewartry of Kirkcudbright. Today, 1798 is a story that still needs to be told, to preserve it from propagandists and also from over-simplification. Over the past few weeks I've been reading "Ireland and Scotland in the Age of Revolution" by Elaine McFarland - an excellent "east-west" telling of the links between Ulster and Scotland in the run-up to 1798, and its aftermath. I'm not sure if it is still in print, but if you are interested in the story I can highly recommend it as a refreshing break from the usual Hibernocentric viewpoint that is so dominant. This book - Rebellions: Memoir, Memory and 1798 by Tom Dunne - is another perspective, telling of how the bicentenary of 1798 was deliberately skewed and mishandled. I haven't read it, but might be worth picking up. [The three point summary at the bottom of the article is particularly apt]. UPDATE: Thanks to Robert, who has done some more digging and has pointed out that on the PRONI website you can see that Templetown signed at the family seat of Castle Upton near Templepatrick, not in Belfast as incorrectly stated in the publication I scanned the photo from. The 36th Ulster Division trained on the estate there, and it is also of course where a man of an earlier generation of people bound together by a Covenant, Rev Josias Welsh (John Knox's grandson) was buried. On the same sheet you'll see the signature of an Alexander Peden! 1301 people signed at Castle Upton, which was one of 20 signing locations in East Antrim alone. NB: I wonder if a fuller, uncropped, version of the photograph might reveal that the long wooden shaft lying across the table in front of the drum was a 1798 Battle of Antrim pike - thereby uniting the people of both drum and pike, implacable opponents in 1798, in common cause in 1912? Now that would be an interesting bit of symbolism.